This past weekend was SO productive.. I love weekends like that. We finished the laundry room, cleaned out the garage, and ripped out/replanted the front planter in our front yard on top of our usual weekend chores (mowing the lawn, cleaning, laundry). And we even got in some pool time). As I was cleaning out the garage, I found these silver little cups that I had purchased at the Salvation Army a while ago. 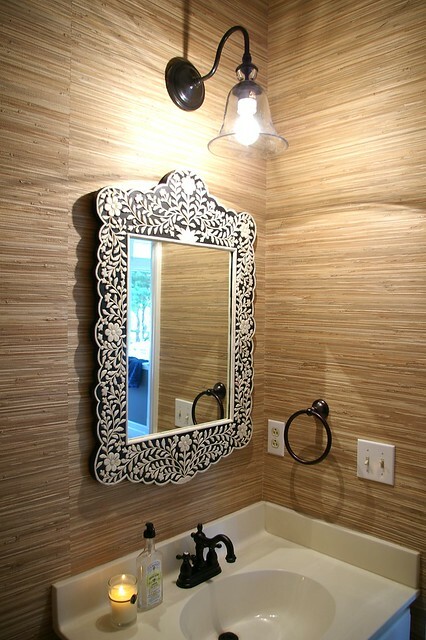 And it sparked (no pun intended) an idea for the powder room. It needed a hand towel and some more color. The pink towel and soap you've seen already. This weekend I added the glass tray that I have had for a while. I was happy to discover my basic box of matches had pretty pink tips that matched the hand towel and soap. Yay for details! I had two sections on the glass tray, and two silver cups found in my garage (well actually four but only needed two for this), so I cut the strike strip from my box of matches, folded it in half and glued it. It's cardboard so it's nice and sturdy and easy to strike. The pink looks great in there. 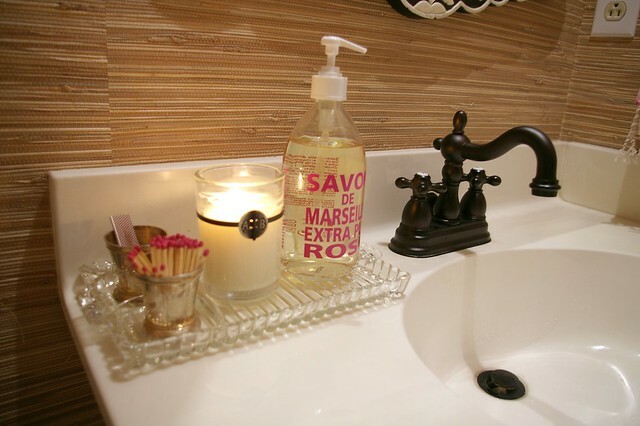 Isn't the rose soap divine! I love that you always focus on the details. I am not sure if I asked before, but did you hang your own grasscloth wallpaper? Nope, I had it hung professionally. The pops of pink are great! Where is that soap from? omg it's the best smelling soap EVER. I bought it at Isabella (the shop I work at). We'll have to add it to the online store! I love the match "tips!" We are in the process of gutting and re-building our second bathroom and I'll have to remember to incorporate those little details into the finishing touches. Looks fantastic! You have such great attention to detail--it makes such a difference!! Love the matching pink elements! Love the wallpaper and that amazing mirror! 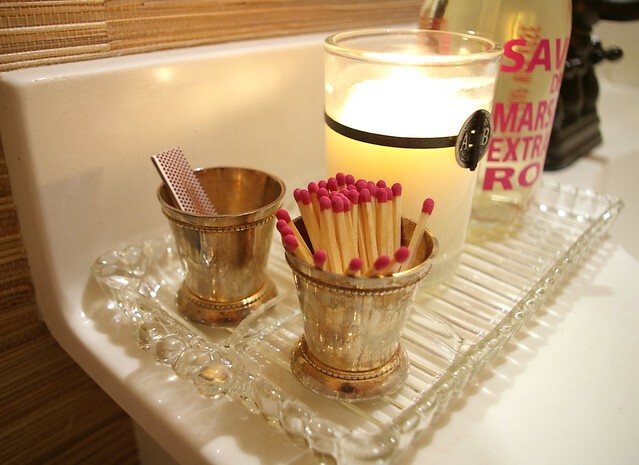 All those details with the matches and a little glass tray - the room looks chic. I'm in love with the pink-tipped matches! Super cute, its amazing what the details can do! 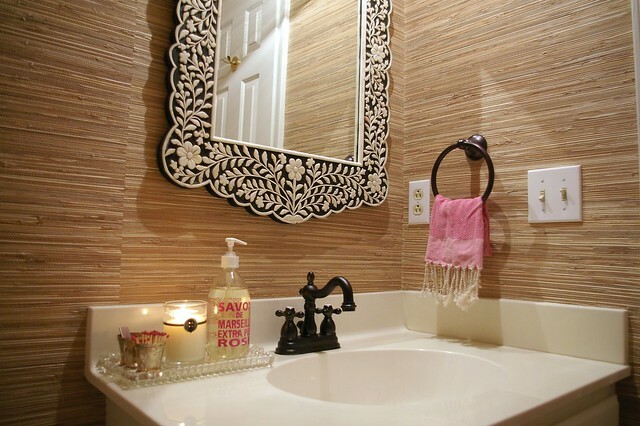 Your bathroom looks great with these additions! 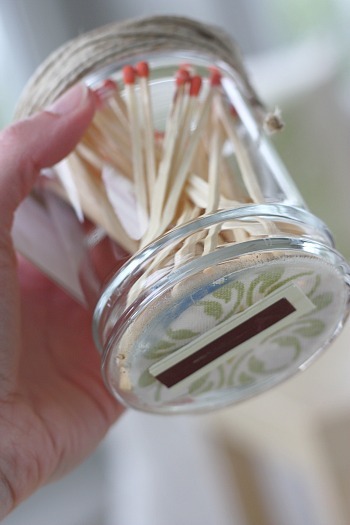 That is such a clever solution for the matches and I love mint julep cups - I have some so I think I'll do this too! I love the pink matches! perfect detail. perfect styling. simple, clean and useful. I love the tiny "julep" cups. also, love the framed Anya in the red colorway...it has such a great William Morris feel to it. I've used it in the brown/aqua in our home. That's a great idea for a guest bathroom! It looks beautiful - even without the granite! Sometimes it is all in the small details. love the pop of pink! it's amazing how those little details like the hot pink match tops can make a room feel extra happy! Yay for details! So pretty! Super clever idea for keeping those mint julep cups in rotation at all times! And I love how you gathered it all together in a tray. Nothing better than doing mini makeovers with stuff you already own! Love the silver cups. Looks perfect! Love the matches! This looks amazing! Everyone in our family is obsessed with that soap you have! Love it! What a great idea to add matches! Where did you get your vanity pulls? LOVE them! i think i need to 'borrow' the match storage / display idea. brilliant! Great idea...I also have a few of those small silver cups! Where did you get the pink matches from?